Junichirou Kagami is a young published physicist, a genius, and a hopeless otaku. At the mercy of YD, a self-diagnosed illness which causes him to only be able to do what he "Yearns to Do," Junichirou foregoes his scientific career to maintain and improve his anime blog. However, when he gets hired as a high school physics teacher; his sister Suzune, no longer willing to tolerate his NEET lifestyle, forces him to take the position. Kagami Junichirou is an otaku NEET with a bad case of YD, meaning that he can only do that which he Yearns to Do. His younger sister isn’t satisfied with that, so she forces him to take a job as a teacher. Unsurprisingly, Kagami is unenthusiastic about teaching, but if any of his students have an issue that he finds amusing, then he decides to help them out. That's the basic premise, and unfortunately, the show doesn't really go beyond it. For the most part, each episode introduces a new student, and then Kagami fixes whatever problems they had with some wacky solution. Every episode follows this same formula, so it doesn’t take long for watching the show to become tedious, especially since an overarching story is near-nonexistent. A-1 Pictures is one of the bigger animation studios. They animate several shows each season, and for both halves of Denpa Kyoushi, they were working on three other animes besides it. However, it looks like they couldn’t quite handle that many at once, since they clearly cut costs for this show’s art, which just does not look good. It lacks a distinctive style, and most colors lack any gradients, so everything just looks flat and lifeless. Sound quality is one of the few things that improved as Denpa Kyoushi went on. The opening and ending themes for the first half weren’t that memorable, but the themes for the second half better fit the vibe of the show, and were all around better. The voice acting also improved. It’s not that it was bad at first, but it was initially dragged down by Matsui Rena, who voiced Kagami’s sister. This was her first role, and she terrible at first, but she became more experienced over the course of the series, and was fine by the end. Denpa Kyoushi’s cast can be broken up into two sections: Kagami and everyone else. I honestly don’t know which is worse. In the beginning, Kagami seemed interesting despite his flaws, but as time went on, he began to fall apart. He’s unbelievably good at various skills for no particular reason, and often acts overly smug and obnoxious. But when he’s not donning his plot armor, he’s complaining about how he doesn’t want to do anything, and his rants about YD quickly grow tiresome. His personality is awful in just about every way, but at least he has one. On the other hand, the rest of the cast is completely lifeless. Each student only plays a major role in the episode where they’re introduced, so there’s really no time to have any sort of depth established. Then, once their moment in the spotlight is over, they’re either whisked off to the sidelines, or off the stage altogether. It’s true that most of them do stick around after their initial appearance, but usually they’ll be left with only a shred of their personality, and be used for plot convenience more than anything else. So, between a lead with a terrible personality and a supporting cast with no personality, characters were easily Denpa Kyoushi’s weakest area. At first, the series really was fun to watch. Kagami’s solutions to problems were fairly creative, and there was still the possibility of an overarching plot. But as the series dragged on, it only got worse. There was no greater story to be found, and Kagami’s plans began to lose their appeal. They became less unique and more contrived, especially when gaming is involved. Honestly, the enjoyment value of this series would have been higher if the series were only 12 episodes, because the length of the show really killed it. In conclusion, I can’t recommend watching Denpa Kyoushi. If the concept interests you, you should instead watch Great Teacher Onizuka or Kami Nomi zo Shiru Sekai, which have similar premises but better execution. But if you absolutely insist on watching this, I’d say jump out at the halfway point. That’s essentially where the series peaks, and everything after that is really nothing new. You know, adaptations of a manga or LN are supposed to be good experiences. You get to see your favorite characters animated and voiced right before your eyes, and even watch a couple of your favorite scenes, which is always a little treat for fans of the show. However, there are times when you get those adaptions that you just...want to forget, permanently. Story: The story of Denpa Kyoushi follows the tale of a man named Kagami Junichiro. As an otaku who is lazy as all hell, his policy in life is the concept of "YD" or "Yearn to do", where he only does things that he really wants to do. And since that isn't very often, he's pretty lazy in that regard. Inversely, he's able to do quite a number of very promising things, like creating a theory for transporting objects instantaneously like Doreamon's pocket so long as he wants to do it. So, after his sister bothers him to go to a job that she got for him, we begin his journey as the Otaku Teacher, Kagami Junichiro. Now, the story for this...mess is...well, nonexistent. The story is basically comprised of helping one student after another. it's an arcic setup with not much differing in between each other because the story goes with Kagami encountering a new "trouble" student, finds out what's wrong with them, then proceeds to teach them something/help them in order to resolve their issue. They're happy, he's happy, he moves on. And really, that's all there is to it. The story doesn't vary in any way, and as a result, there really isn't much development for characters aside from the "helped" ones, and the development itself just seems too convenient for really anything. Characters: As for characters, Denpa Kyoushi has Junichiro, and the plot fodder. As for Junichiro, Junichiro is an otaku who yearns only to do what he wants. After becoming a teacher by the volition of two different girls, Kagami becomes a teacher not out of his own free will and lazes around as he is still the same kind of person as he was. Throughout the whole series, Kagami helps out the kids because he just simply wants to, and as a result, doesn't change all that much as a character. His lack of character change hones him into this static role of helping various students and as such, especially with this arcic setup, we don't get to know much about him other than the fact that he is apparently really smart, but only when he wants to be. And then we have the other characters. I group everyone else all in one category simply because there just isn't much to say about any of them. Most of them are students that Kagami has helped and as such, are sort of a go to, pass along sort of deal, since every student Kagami helps either fades into the background as a side character, or just disappears entirely. Because of this, you don't get very much development for any of them and they just become plot devices. Art: Now, the art. Art...isn't really Denpa Kyoushi's thing. In fact, it's so bad that I swear the budget for it was 5,000 yen at most. With its very bland colors that are just sort of...colors, Denpa Kyoushi doesn't offer anything substantial to the art in the world of anime simply because it just looks terrible. But that isn't the only issue. The main issue with Denpa Kyoushi is not just that the art itself is just bland, uninspirational, and generic at most, but it's inconsistent, horrendously inconsistent. The characters never look the scene in one scene to another, where eyes can be shifted to different places, the face shape or hair can look different, and the noses, OH THE NOSES. Half the time, the noses for the characters aren't even there, not even a little line to indicate that they even have one. As a result, the characters resemble one of those happy faces children draw when they're little and it just looks horrid! Sound: The soundtrack for Denpa Kyoushi is nothing to write home about. They're generic tracks that are average at most. Personal Enjoyment: Well, Denpa Kyoushi was quite the disappointment. Hearing about how the show itself didn't relate to the manga at all, I was having my doubts about its quality, like when I watched Isuca a while back. Needless to say, this was not the best thing to come out of Summer 2015. Did I enjoy this show? Admittedly, I did. For about the first few episodes or so. But because it's so repetitive, I saw no reason in liking it, and as such, grew a growing hatred of it with each passing episode. It's bland. Out of everything about this show, there just wasn't anything positive to say about it. The show itself has a repetitive plotline that doesn't feel fun to watch. And because it's the same godforsaken thing week after week with its "kid of the week" setup, there just isn't anything that's great about it due to its lack of variation. Also, I found some of the things going on in the series to be quite cringeworthy. (Like...family power rangers. Why...) And because this is the section where I can say something I don't like, I'll say it again. They don't have noses half of the time. There are many times in this show where they simply...just...don't...have...noses. Or any indication of having one. And it is very weird to see a person without a nose. I'll cut straight to the point. No. Don't hurt yourself in watching this poor adaptation of a rather popular manga. If you do, you will regret the decision like I do. This one belongs in the "pretend it didn't happen" section of anime. Now this series was very VERY interesting to watch. Thanks to the series I now have a new acronym I use now. Kagami Junichirou was known as a physics genius when has was a teenager, even being published in "Nature". However after college, he suddenly lost all interest in science and became a NEET. He devoted himself to his anime blog and collecting merchandises. As somewhat of an excuse he claims to have a serious illness called "YD" which stands for "Yearn to Do" meaning that he can't do anything he doesn't want to do. Worried about her brother's future, her little sister manages to get him a job teaching physics at his old high school. He's not an enthusiastic teacher but he becomes somewhat popular with the students. After helping a girl who's being bullied, Kagami finds that he actually likes teaching. Will he continue teaching? Will he go back to physics? or will he return to being a NEET? This anime was fun to watch! There was a lot of hilarious scenes in the show and each character that appeared had a unique personality; with nicknames made by Kagami which describes the characters perfectly. In the end each lesson in the series is related to each other and leads to Kagami's ultimate decision in the final episode. 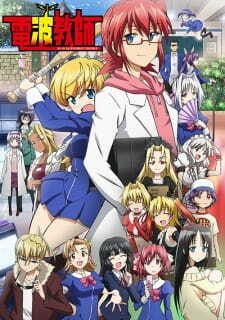 If you like comedy then watch this anime! It's full of laughs and is interesting is watch! One of the best anime,which I yearn to watch. This anime totally changed my life and perspective of viewing the world.It inspires me to do something new. Junichiro Kazami was known as a physics prodigy back when he was in high school, but now in his post-college years he's got a major case of YD – he claims he can only do something that he “yearns to do.”Junichiro Kagami, a NEET who used to be a theoretical physics prodigy (but only because he wanted to prove an Anywhere Door was possible), but would now rather spend his time fiddling away with his anime blog. He has no desire to get a real job and groans when his sister tells him she's gotten him a job as a high school physics teacher at his alma mater.